I had the incredible privilege of sitting second row at my FAVORITE designer’s show at New York Fashion Week. The whole time I was waiting for someone to pinch me, but when the music was bumping and I could hear the faint click-clack of the model’s heels, I realized it was 100% real. I was about to see the Nicole Miller show! When the first model rounded the corner I mentally put a check mark beside a bucket list item in my head. It. was. awesome. I wish I had a million words to describe how fun and inspiring it was, but I only have this blog post so I hope I can do it justice. Now where do I start? I decided to wear all black, per the advice of my fashionista aunt, so I went with this look. I had to add in a pop of leopard, in true Nicole Miller taste. You can shop my entire outfit here. Size up in the jacket! But who cares what I wore? Let's get down to the fun stuff. Nicole Miller is my favorite designer because lots of her pieces are grungy but feminine. Everything she designs is wearable for girls like you and me. It is so fun to watch her show because you'll see impressive, creative design and impeccable craftsmanship that you can actually fit into your own wardrobe. When you think of high-end designer fashion shows I'm sure crazy, couture, wild outfits and headpieces come to mind. 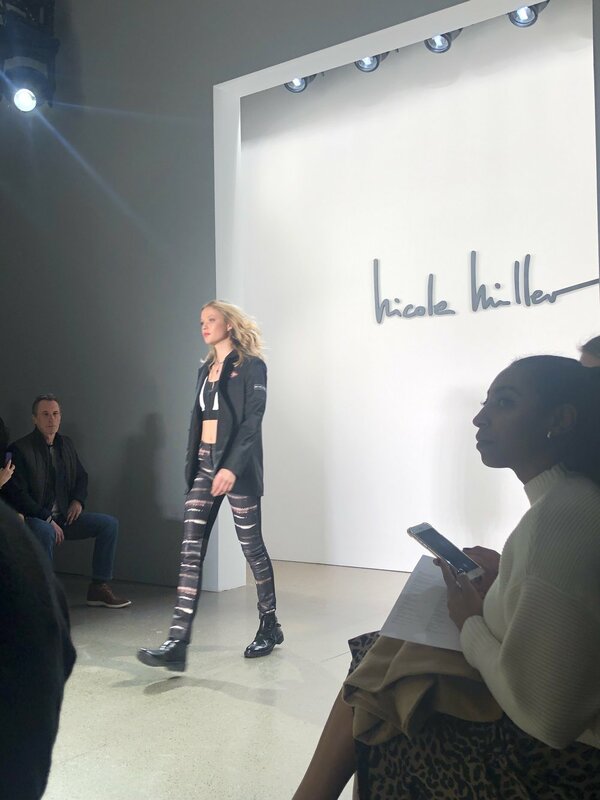 Nicole Miller’s show is so much more relatable than that! This collection is Ready to Wear and you can browse all of the looks here. It is incredible to see the entire cohesive line at one time, so be sure you scroll through all of the pictures. Here are a few of my favorites from her Fall/Winter 2019 collection. The effortless mixing of patterns and textures is so flawless. Not to mention I love a good camo print. These astrological symbols were featured in a lot of her pieces and I LOVE the pattern she has created with them. I wish you could see how this dress flowed down the runway. Another amazing pattern is this evil eye one. You can bet you’ll start to see these everywhere for fall and winter 2019. I think it is genius the way she takes such a unique and grungy pattern and makes it look so feminine and chic on a pretty, elevated blouse. The chain belt is very ‘90s and I’m very into it. The way she mixes fur into several outfits is just too cool. I would never think to pair these items together, but when she does it, it makes perfect sense. I love the sweatshirt layered underneath an otherwise dressy set. You’ll see lots of layered chain necklaces, so keep that in mind when you are shopping for accessories this fall! Bet you can’t guess which piece was my favorite!? Yep. The leopard coat. I love these two colors together and if I owned this coat I would never ever take it off! Everyone I met at the show was so welcoming and friendly. Here I am, your average small town girl, and these designers, influencers and PR professionals were introducing themselves to me and including me in their conversations before the show started. The entire experience was so enjoyable and I would like to thank Missie Allen for connecting me with Cynthia Nixon, the Vice President of Design, and giving me the opportunity to attend! It was truly a night I will never forget! My view was ahhh-mazing. Since phone pictures simply won’t do the beautiful models or clothes justice, all other photos in this post are from FashionWeekDaily.com. Obviously I didn’t want to spend the entire time taking photos, but here are some snapshot from my seat. I even uploaded a quick video to YouTube so that you can see the ending of the show. All in all, it was definitely a night to remember and set the tone for all fashion shows to come. I’m one happy girl! To see more behind-the-scenes footage, checkout the Nicole Miller Instagram account and watch the nyfw highlights!